A designer in Milan lays out six innovative ideas for a "bio-diverse metropolis"
Italian architect Stefano Boeri dreams big and green. He has created six bold, transformational "ideas for a bio-diverse metropolis" that could be installed in and around the city of Milan, to establish "transitional states between the city, nature and agriculture" and provide "energy sources for a new model of urban economics." Visionary and Idealistic, they challenge us to think about cities and the possible in new ways. The concepts were first introduced to the public at an exhibition in Rome last year. Milan, like every city in the world, today, is at a crossroads. It can continue growing by eating up agricultural land, woods, natural space, and thus reducing biodiversity and the space available to other species. Or it can choose to become a bio-diverse metropolis, starting with a new agreement between the city, the natural world and agriculture. BioMilan provides a vision of a city which stops expanding into rural areas and choose to grow by regeneration and by increasing the presence of natural and biological spaces. BioMilan has at is heart the idea of a new kind of agriculture which surrounds the city, provides work and produces for local agro-food markets. BioMilan allows nature to find spaces where it can express forms of biodiversity, both inside and outside of the city’s borders. BioMilan is a political project which aims to increase the number of businesses which, working together in areas linked to agriculture, forestation and renewable energy, can regenerate the urban economy and provide forms of integration and work for thousands of citizens. Vertical Forest: a tower with 1500 trees. This 27-story forested apartment building, writes Diane Pham on the ever-fascinating design site Inhabitat, is already being built. Wood House: social housing and the tree cycle. I’m not sure about this project to build “low density and low cost" subsidized affordable housing using prefab construction with recycled wooden panels. I’d have to know a bit more about the definition of "low density" and the justification. Courtyard Farms: a constellation of epicentres within systems of neighborhood architecture. The idea is to take 60 publicly owned and currently abandoned farms around the edge of the city and make them productive again. Expo 2015: a global kitchen garden. This would create an agricultural greenbelt around the city focusing on food production for the city. The global part seems to be a nod to Milan’s cosmopolitan food scene. Metrobosco: a forest around Milan. A ring of forested land to serve as wildlife habitat. Biological and plant decontamination of polluted urban areas. "The cleaning up of ex-industrial areas and obsolete structures in the city through biological and plant cultivation creates new possibilities for public open space. Through the cultivation of polluted land, they can be cleaned-up and biomass is also created, and in this way the city can regain lost spaces which were seemingly lost forever." There isn’t a lot more on the project’s website, and I’m intrigued to learn more. The third, fourth and fifth ideas all speak to the greenbelt concept. Perhaps they could be combined in some way, depending on site-specific opportunities? 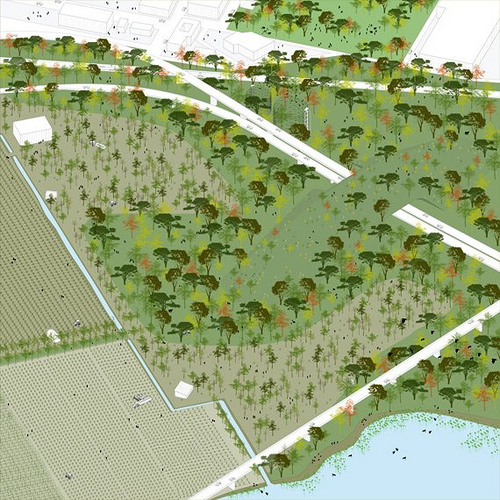 In some ways, Boeri’s vision seems to be a cousin of Jeanne Gang’s "Reverse Effect" proposal, assisted by my colleagues in NRDC’s Midwest office, to re-envision Chicago’s waterways and adjacent lands. Massively ambitious and ambitiously massive at the same time, and intended as much to get the conversation going as anything. Bold, visionary ideas often spawn pragmatic ones. Each apartment in the building will have a balcony planted with trees that are able to respond to the city’s weather — shade will be provided within the summer, while also filtering city pollution; and in the winter the bare trees will allow sunlight to permeate through the spaces. Plant irrigation will be supported through the filtering and reuse of the greywater produced by the building. Additionally, Aeolian and photovoltaic energy systems will further promote the tower’s self-sufficiency. The design of the Bosco Verticale is a response to both urban sprawl and the disappearance of nature from our lives and on the landscape. The architect notes that if the units were to be constructed unstacked as stand-alone units across a single surface, the project would require 50,000 square meters of land, and 10,000 square meters of woodland. Bosco Verticale is the first offer in his proposed BioMilano. The building is also featured in a nicely researched and written article on hyper-advanced green buildings and their historical antecedents, by Christopher Woodward in The Financial Times.